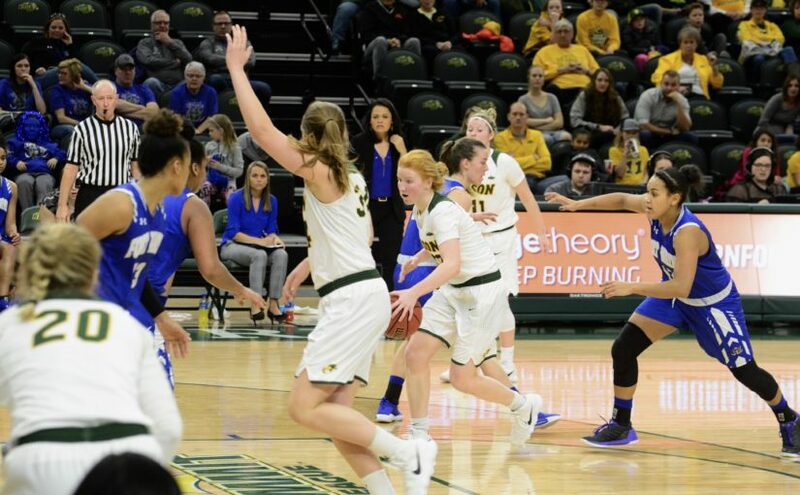 The North Dakota State women’s basketball team took their first win of the conference season, beating Fort Wayne 72-56 Saturday. After a three-game road trip, the Bison returned home and committed to the defensive side of the game. With a struggling Mastodons team visiting, the Bison did just that. Just three minutes in, Sarah Jacobson picked Payton Fallis’ pocket and hit Marina Fernandez in transition, who laid it in for the Bison. That made the score just 4-2, but after Fort Wayne tied the game at four, NDSU led the rest of the way. A 9-0 run was punctuated by Taylor Thunstedt knocking down a 3-pointer. While the Bison put points up on the board, the Mastodons struggled to do so. Starting in the end the first, Fort Wayne missed nine straight three-point attempts. NDSU set off extending the gap, pushing hard down low. Macey Kvilvang connected on the old-fashioned 3-point play to make the score 26-14. In the second quarter, the Bison outscored the Mastodons 13-5. Fort Wayne shot a poor 23.1 percent from the floor in the first 20 minutes of play. The Bison continued their efficiency in the third quarter, led by the play of Sarah Jacobson. The sophomore scored seven of the Bison’s first nine points in the half. It was all part of an afternoon in which she led the Bison with 19 points, four assists and three steals. Inside the second half, Reilly Jacobson got on a roll. She collected 10 of her 16 points in the third quarter. Twelve of her total came inside the paint, where NDSU held a 32-10 advantage. “Being able to protect the paint, that is something we have talked about with our defensive urgency, and I thought both the guards and the post did that,” head coach Maren Walseth said. The Bison dominated the glass as well. NDSU held a 40-27 edge on rebounds. The Bison were led by Autumn Ogden, making her first start of her career, and Kvilvang, who each recorded seven. Fort Wayne was held to just 30.2 percent shooting on the afternoon, underlining the defensive performance from the home side. NDSU improves to 8-11 on the season and to 1-4 in the Summit League. Fort Wayne drops to 4-16 (1-6 SL). The Bison look to keep the good feelings rolling with a trip to Omaha on Tuesday. The Mavericks sit at the bottom of the Summit League, still looking for their first conference win.